Katy says: This has been a hectic week for me here in Caracas, and I will be sharing my impressions with you next week. But this little news item made me want to give you a preview. It is about the Portuguese government's displeasure with the use of its Prime Minister's picture in Chavez's presidential campaign. 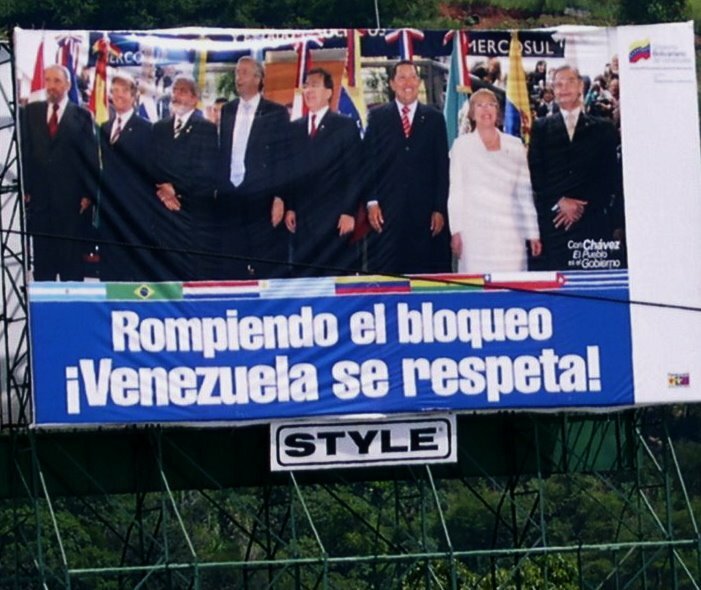 Other foreign ministries should take notice of this other sign, since it greets you while driving up from the airport into Caracas. I wonder what the governments of Uruguay, Paraguay or Chile think of their presidents' image being used in signs for Chavez's election paid for with taxpayer money. PS.- The sign is similar to the one with the Portuguese Prime Minister, and it reads "Breaking the blockade - Venezuela deserves respect!" It's anyone's guess which blockade he is referring to.